The response header of MyCode.js contains Access-Control-Allow-Origin: http://siteB, which I thought meant that MyCode.js was allowed to make cross-origin references to the site B. The client triggers some functionality of MyCode.js, which in turn make requests to http://siteB, which should be fine, despite being cross-origin requests. One thing is sure - I still do not understand how am I supposed to use this header. I do not want to utilize JSONP. Access-Control-Allow-Origin is a CORS (Cross-Origin Resource Sharing) header. When Site A tries to fetch content from Site B, Site B can send an Access-Control-Allow-Origin response header to tell the browser that the content of this page is accessible to certain origins. (An origin is a domain, plus a scheme and port number.) By default, Site B's pages are not accessible to any other origin; using the Access-Control-Allow-Origin header opens a door for cross-origin access by specific requesting origins. If the server responds to the OPTIONS preflight with appropriate response headers (Access-Control-Allow-Headers for non-simple headers, Access-Control-Allow-Methods for non-simple verbs) that match the non-simple verb and/or non-simple headers, then the browser sends the actual request. When sending the actual request (after preflight is done), the behavior is identical to how a simple request is handled. In other words, a non-simple request whose preflight is successful is treated the same as a simple request (i.e., the server must still send Access-Control-Allow-Origin again for the actual response). See Understanding XMLHttpRequest over CORS for a little more information about non-simple requests. Only if the response contains "Access-Control-Allow-Origin" AND its value is "*" or contain the domain who submitted the CORS request, by satisfying this mandtory condition browser will submit the actual Cross-Domain request, and cache the result in "Preflight-Result-Cache". Question is a bit too old to answer, but I am posting this for any future reference to this question. A resource makes a cross-origin HTTP request when it requests a resource from a different domain, or port than the one which the first resource itself serves. An HTML page served from http://domain-a.com makes an <img> src request for http://domain-b.com/image.jpg. Many pages on the web today load resources like CSS stylesheets, images and scripts from separate domains (thus it should be cool). For security reasons, browsers restrict cross-origin HTTP requests initiated from within scripts. For example, XMLHttpRequest and Fetch follow the same-origin policy. So, a web application using XMLHttpRequest or Fetch could only make HTTP requests to its own domain. To improve web applications, developers asked browser vendors to allow cross-domain requests. 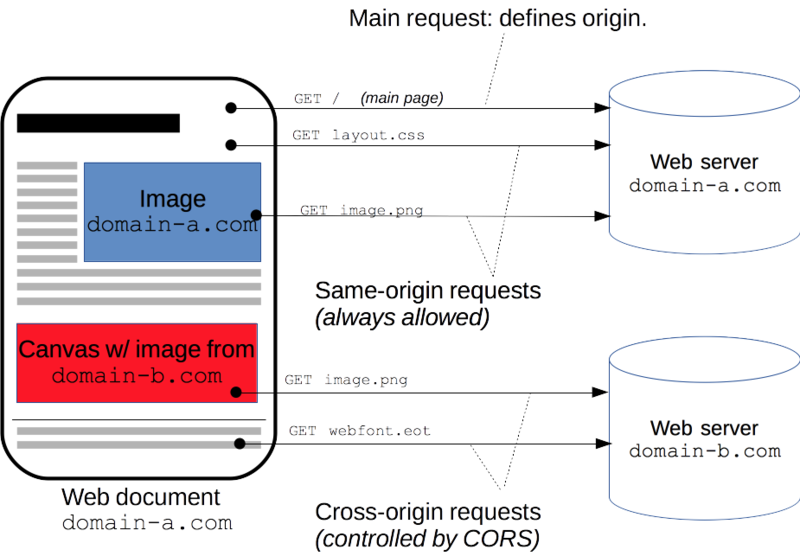 The Cross-Origin Resource Sharing (CORS) mechanism gives web servers cross-domain access controls, which enable secure cross-domain data transfers. Modern browsers use CORS in an API container - such as XMLHttpRequest or Fetch - to mitigate risks of cross-origin HTTP requests. The CORS standard describes new HTTP headers which provide browsers and servers a way to request remote URLs only when they have permission. Although some validation and authorization can be performed by the server, it is generally the browser's responsibility to support these headers and honor the restrictions they impose. The browser sends the OPTIONS request with an Origin HTTP header. An Access-Control-Allow-Origin (ACAO) header in its response indicating which origin sites are allowed. Whenever I start thinking about CORS, my intuition about which site hosts the headers is incorrect, just as you described in your question. For me, it helps to think about the purpose of the same origin policy. Just by adding the Proxy link will work, but it can also throw error for No Access again. Hence better to add header as shown below. 2. The response header of MyCode.js contains Access-Control-Allow-Origin: http://siteB, which I thought meant that MyCode.js was allowed to make cross-origin references to the site B.
no. It means, Only siteB is allowed to do this request. So your request for MyCode.js from siteZ gets an error instead, and the browser typically gives you nothing. But if you make your server return A-C-A-O: siteZ instead, you'll get MyCode.js . Or if it sends '*', that'll work, that'll let everybody in. Or if the server always sends the string from the Origin: header... but... for security, if you're afraid of hackers, your server should only allow origins on a shortlist, that are allowed to make those requests. Then, MyCode.js comes from siteA. When it makes requests to siteB, they are all cross-origin, the browser sends Origin: siteA, and siteB has to take the siteA, recognize it's on the short list of allowed requesters, and send back A-C-A-O: siteA. Only then will the browser let your script get the result of those requests. this must have before all router. This will allow to share content for different domain. In Python I have been using the Flask-CORS library with great success. It makes dealing with CORS super easy and painless. I added some code from the library's documentation below. For more specific examples see the documentation. I have used the simple example above to get around the CORS issue in an ionic application I am building that has to access a separate flask server. Simply paste the following code in your web.config file. CORS - Is it a client-side thing, a server-side thing, or a transport level thing?